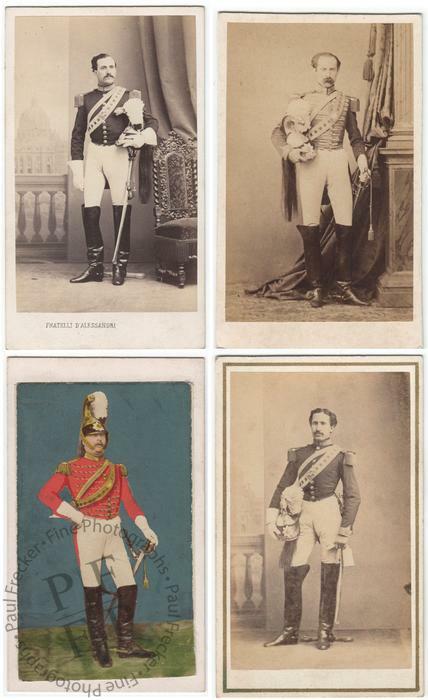 Four cartes-de-visite showing unidentified Italian cavalry officers, including one hand-coloured portrait. Two of the portraits are by Fratelli d’Alessandri of Rome; one of the portraits is by Altobelli and Molins of Rome; one of the photographers (the hand-coloured portrait) is unidentified. Condition: two of the prints present some small imperfections and fine spotting; one of the mounts presents some light stains verso; otherwise, condition of prints and mounts is excellent. Dimensions: the dimensions of a standard carte-de-visite are approximately 4.1" by 2.5" (10.5 cm by 6.3 cm).